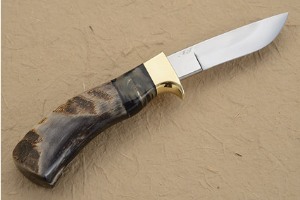 Description: Perhaps most desired of Mastersmith Bill Burke's knives are his black sheep horn hunters. Black sheep horn is extremely hard to find -- especially of this quality. 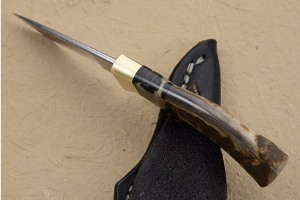 The deep black handle has lighter highlights and tremendous interest. 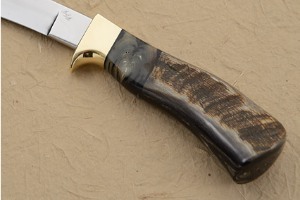 Bill considers the sheep horn used on this knife to be among the best horn that he has found. This 3-1/2 inch hunter is a perfect size for detail work when skinning or used as a bird and trout. 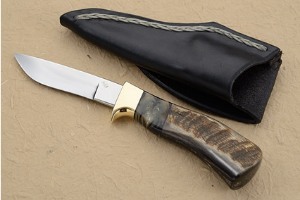 Bill Burke's knives are as high performance as a hunter can get -- the sort of knife that if you were stuck out in the woods or on a desert island and only had one tool, this would be it. Each knife is pre-tested for edge flex and cutting ability before assembly -- ensuring both edge holding a strength. The heat treatment is a highly detailed process that was developed between Mastersmith Ed Fowler and Bill Burke after years of trial and experimentation. This technique, involving low temperature forging, a triple quench and triple temper creates some of the sharpest and most long lasting edges found anywhere. When wet, sheep horn does not become slippery, and it is amazingly durable. The spacer is created by taking two sheep horn end cuts and aligning them outward, producing a very pleasing effect. Excellent fit and finish throughout. An amazing find!